The effectiveness of any adaptation or mitigation action in Corn Belt agriculture depends on the degree to which the region’s farmers are willing and able to act. At the outset of this project, little was known about farmers’ perspectives on these critical topics. A primary objective of this project is to conduct social science research that assesses farmer understanding of climate change and attitudes toward adaptive and mitigative practices and strategies. 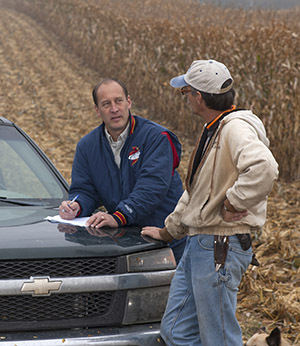 Toward that end, a survey of 5000 farmers from 22 watersheds in 11 Corn Belt states was conducted in February 2012. The survey was conducted in partnership with the Useful to Usable (U2U) project (www.AgClimate4U.org), another USDA-funded climate and agriculture project. The watersheds that were surveyed account for more than half of all US corn and soybean production. Farmers selected for the survey were those who grew corn and who had more than $100,000 in gross farm income in 2011; these larger-scale farmers cultivate approximately 80 percent of the farmland in the region. Weather maps that were developed using data from National Weather Service Cooperative Observer weather stations from across the region are also presented. The maps show differences over time in extreme precipitation, drought, and heat stress by watershed. 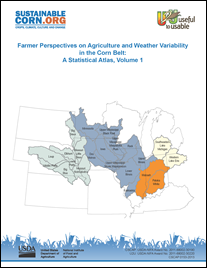 We intend the maps and tables to be resources that extension educators, agricultural advisors, and other agricultural stakeholders across the region can use to help them understand farmer perspectives in their local areas. It is recommended that you download/save these chapters before opening. Depending on your internet connection speed, it may take a few seconds or a few minutes to download/save each chapter. Note: This report contains some blank pages. NOTE: Due to the file's large size, it is recommended that you download/save this report before attempting to open it.